Like Excel, Google's online spreadsheet program Sheets has no DIVIDE function. Instead, you create a formula in Google Sheets to perform division operations. Learn how to create the formula, how to deal with errors you might experience, and how to use the DIVIDE formula for percentage results. To divide two numbers in Google Sheets, you create a formula. Formulas always begin with an equal sign ( = ). The equal sign always goes in the cell where you want the answer to go. The division operator is the forward slash ( / ). The formula is completed by pressing the Enter key on the keyboard. It is possible to enter numbers directly into a formula as shown in rows 2 and 3 in the example image. It is much better, however, to enter the data into worksheet cells and then use the addresses or references of those cells in the formula as shown in rows 4 to 6 in the example. By using cell references — such as A2 or A5 — rather than the actual data in a formula, if it later becomes necessary to change the data, you replace the data in the cells rather than rewrite the formula. The results of the formula update automatically when the data changes. 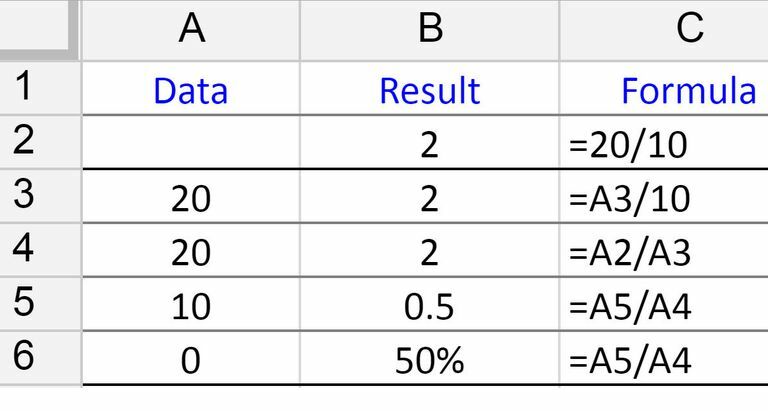 divides the data in cell A2 by the data in A3 to return an answer of 2.
into cell B4 and have the correct answer of 2 display in that cell, it is better to use point-and-click or pointing to add the cell references to formulas, especially with long formulas. Doing so minimizes the possibility of errors created by typing in the wrong cell reference. 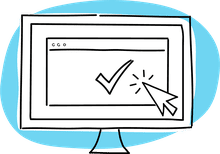 Point-and-click involves clicking on the cell containing the data with the mouse pointer to add the cell reference to the formula. Type = (equal sign) in cell B4 to begin the formula. Click on cell A2 with the mouse pointer to add that cell reference to the formula after the equal sign. Type / (the division sign or the forward slash) into cell B4 after the cell reference. Click on cell A3 with the mouse pointer to add that cell reference to the formula after the division sign. Press the Enter key on the keyboard to complete the formula. The answer 2 should be present in cell B4 since 40 divided by 20 is equal to 2. Even though the answer is seen in cell B4, clicking on that cell displays the formula =A2/A3 in the formula bar above the worksheet. To test the value of using cell references in a formula, change the number in cell A3 from 20 to 40 and press the Enter key on the keyboard. The answer in cell B2 should automatically update to 4 to reflect the change in data in cell A3. The most common error associated with division operations is the #DIV/O! error value. This error is displayed when the denominator in the division formula is equal to zero, which is not allowed in ordinary arithmetic. The most likely reason for this happening is that an incorrect cell reference was entered into the formula or the formula was copied to another location using the fill handle, and the changing cell references results in the error. A percentage is a just a comparison between two numbers that makes use of the division operation. More specifically, it is a fraction or decimal that is calculated by dividing the numerator by the denominator and multiplying the result by 100. The numerator is set to 10. The quotient is equal to 0.5. That result can be changed to a percent by changing the formatting in the cell to percent formatting from the default Automatic format as shown by the 50% result displayed in cell B6 of the example. That cell contains the identical formula as cell B4. The only difference is the formatting on the cell. In effect, when percent formatting is applied, the program multiplies the decimal value by 100 and adds the percent symbol.